In his search, Di Matteo was re-examining archival data from the two German-NASA Helios spacecraft, which launched in 1974 and 1976 to study the Sun. But this was 45-year-old data he’d never worked with before. The flawless, wave-like patterns he initially found hinted that something was leading him astray. Over the next seven years, Parker will fly through unexplored territory, soaring as close as 4 million miles from the Sun. Before Parker, the Helios 2 satellite held the record for the closest approach to the Sun at 27 million miles, and scientists thought it might give them an idea of what to expect. 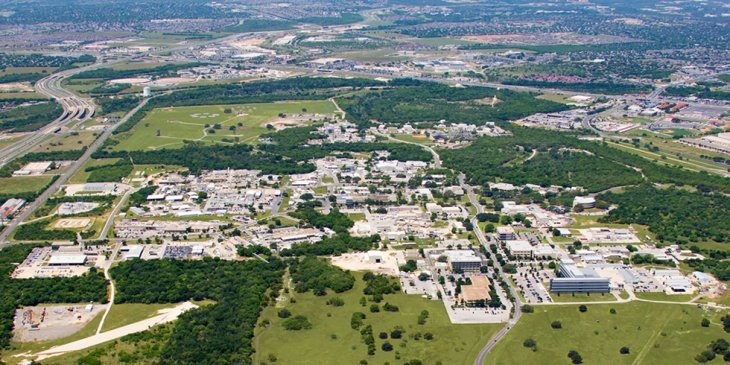 “When a mission like Parker is going to see things no one has seen before, just a hint of what could be observed is really helpful,” Di Matteo said. A mission nearly 60 years in the making is ready to launch on a historic flight to become the first spacecraft to “touch the surface of the Sun”. 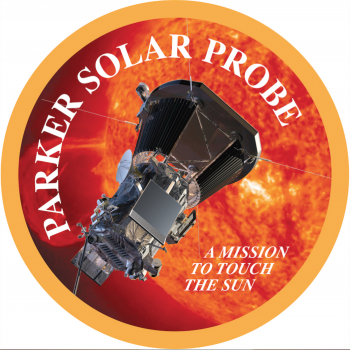 NASA’s Parker Solar Probe, named after Dr. Eugene Parker, will unlock many of the mysteries still held by our solar system’s star. The probe was set to launch atop at on Saturday but suffered from a scrub just minutes from launch due to an issue with a helium regulator. Another attempt will take place on Sunday, with the window opening at 03:31 Eastern. The Delta IV Heavy (Delta 9250H) is an expendable heavy-lift launch vehicle, the largest type of the Delta IV family and the world’s second highest-capacity rocket in operation, with a payload capacity half of SpaceX’s Falcon Heavy rocket. It is manufactured by United Launch Alliance and was first launched in 2004. Parker Solar Probe and the Delta IV Heavy are slated to launch within a 65-minute launch window. After liftoff, Delta IV Heavy will pitch downrange and head due east over the Atlantic Ocean. Shortly after liftoff, the center core of the three Common Booster Cores (CBCs) of the first stage will throttle back to conserve propellant as the two side CBCs provide the brunt of the force lifting the rocket out of the dense lower atmosphere. At T+3 minutes 56 seconds into the flight, the two side cores will separate, and the center core will power back up to full thrust, burning until T+5 minutes 36 seconds – after which the center core will separate. The Delta Cryogenic Second Stage (DCSS) will then ignite for the first of its two burns. The first of these burns will end at T+10 minutes 37 seconds – at which point Parker Solar will be in its initial parking orbit. The DCSS will reignite for a second burn at T+22 minutes 25 seconds. This burn will last for about 14 minutes. After the second DCSS engine cutoff, the 2nd and 3rd stages will separate – with the Northrop Grumman-built third stage, the STAR 48BV. This is a solid propellant stage that will produce 17,490 lbs of thrust for just 84 seconds. But in that 84 seconds, the third stage will impart two-thirds of the total velocity of the launch phase. Once that small duration burn is complete, Parker Solar Probe will separate from the third stage and be on its inward dive toward Venus. Assuming launch on 11 August, Parker Solar will encounter Venus for the first of seven flybys on 2 October 2018. 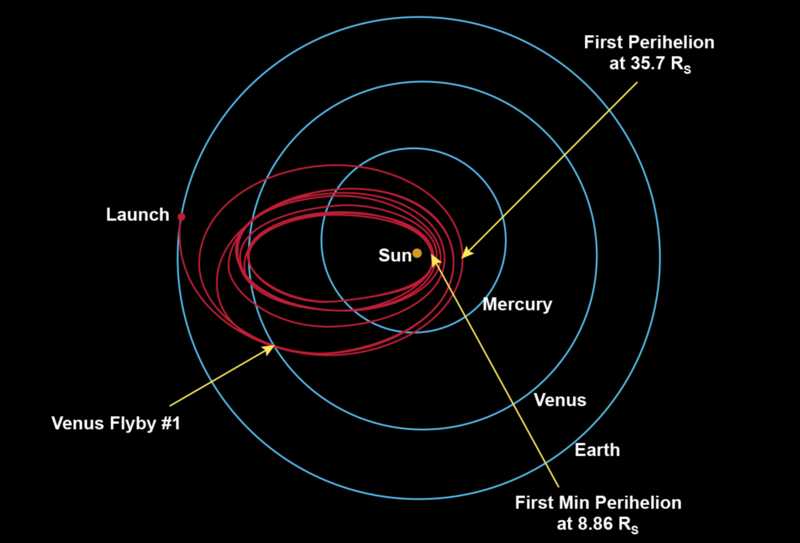 It will then perform its first close flyby of the Sun – perihelion – on 5 November 2018. Videographer Lee Hobson and photographer Ed Whitman spend their days documenting mankind’s mission to “touch” the sun. Lee Hobson and Ed Whitman flew to Florida in style three months ago, touching down in the Sunshine State in a Boeing C-17 loaded with priceless cargo: the Parker Solar Probe. Hobson, director of photography for the Johns Hopkins Applied Physics Laboratory, is the video documentary lead for the APL-led mission to “touch” the sun. He and Whitman, APL’s senior photographer, have spent the past four years painstakingly documenting the construction and testing of the probe, which is scheduled to launch in August. Flying through the sun’s corona, or atmosphere, and facing heat and radiation like no spacecraft before it, the Parker Solar Probe will provide new data on solar activity and make critical contributions to scientists’ ability to forecast major space-weather events that impact life on Earth. The Hub caught up with Hobson and Whitman to talk about their work, the mission, and what it’s like to stand in the presence of the spacecraft that could change humanity’s understanding of Earth’s closest star. How did you get involved with APL and documenting its projects? Ed Whitman: As a kid, I was always fascinated with how things worked. There was nothing in my home that was safe from me and a screwdriver. I knew early on that I wanted to do photography, and I had my own company for many years, but when the opportunity at APL came up it just seemed like the right fit. I took the position and just loved it because, you know, I’m basically a frustrated engineer. Lee Hobson: I joined in 1988 as a staff photographer and then moved into the video sector in 1996. On any given day I could be working in air defense or force projections, or national security analysis and research, or of course space exploration. That’s what’s really cool about APL—there’s a lot of different things we work on. “[W]e’re working next to the spacecraft that’s going to fly within 4 million miles of the sun, and I get to walk around the launchpad. That’s really cool,” says Hobson. 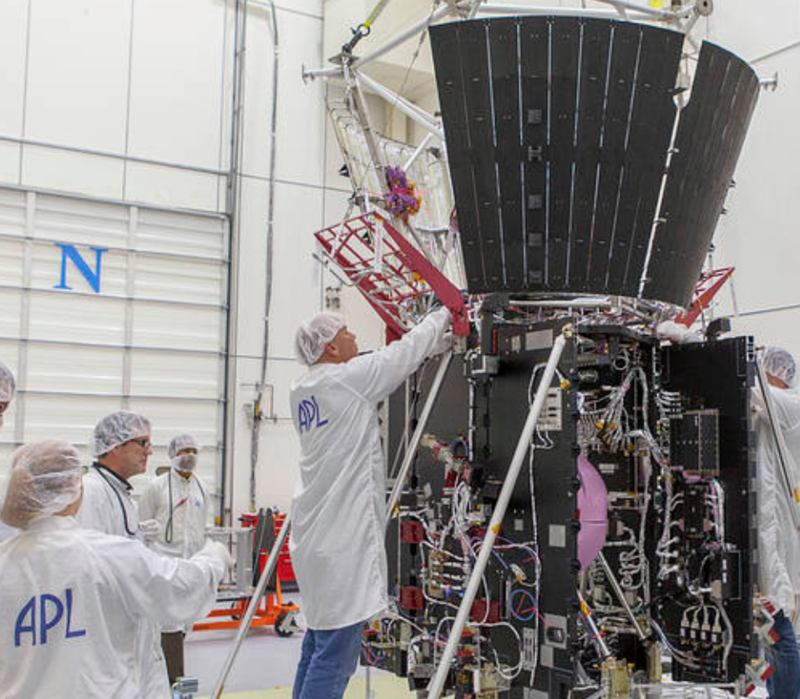 What’s it like to document the Parker Solar Probe? LH: The average day is about 10 hours here, but it’s sometimes as long as 15 hours depending on what we’re doing. Ed and I are unique in that when the day’s operation is finished, we don’t go home, we come back to the office to edit footage. So it can be a really long day. EW: We do press releases for the public, and those are more like the milestone events when significant things happen. But day to day, I’m working with the mechanical team, shooting everything that’s being integrated into the spacecraft—every nut, every bolt, every process that takes place. And that’s helpful because if the mechanical team gets a faulty software reading or a piece of hardware that’s not functioning properly, they can go back through our photos and images and diagnose the problem. What’s been your favorite experience documenting the Solar Probe? LH: I’ve really enjoyed writing and editing the Solar 60 video series. I wanted to come up with a way of telling a story through the eyes of our different technicians and scientists and engineers. They get to be the reporters, and they have great camera presence, and I get to be the producer and script writer. So that’s a lot of fun, getting to tell those stories. And, of course, the access that I have to the spacecraft. I mean, we’re working next to the spacecraft that’s going to fly within 4 million miles of the sun, and I get to walk around the launchpad. So that’s really cool. EW: For me, it’s interesting to see the process of building something that’s so highly engineered and thought out but is still a one-off that’s never been built before. And I got to integrate my photography with the mechanical team for a test they needed to conduct: They had to lift the spacecraft way up in the sky and then drop down this magnetometer boom, and they had to do it really carefully so they could see how things were working. As it was coming down, I was walking around taking photos in 360 degrees, and I was shooting the photos to the lead engineer using my iPad. I mean, this $2 billion spacecraft is dangling from this lift in front of me and from my photos, the engineer can see the boom harness and determine the clearance and how it interacts with the spacecraft. 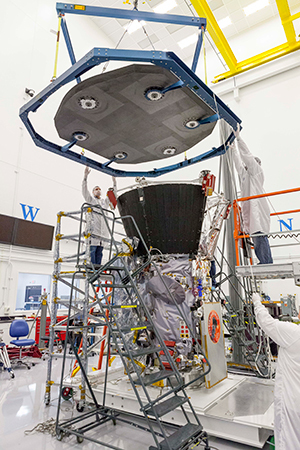 What’s the most surprising thing about your work with the Solar Probe? EW: The spacecraft is so light! It’s only 1,500 pounds, and it’s being launched in literally the biggest launch vehicle ever built, the Delta IV Heavy. It’s a monster! It stands in front of you like a building. You feel so tiny and insignificant when you look at it, and the spacecraft—they call it a hood ornament—it’s this tiny thing in this giant housing, but those are the things that are going to fall away during launch. It’s just mind-boggling to me. 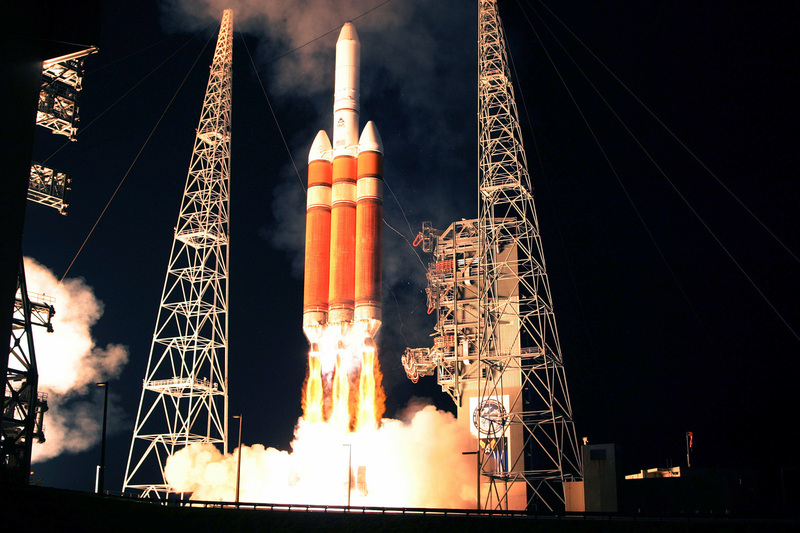 “[The spacecraft is] being launched in literally the biggest launch vehicle ever built, the Delta IV Heavy. It’s a monster! It stands in front of you like a building,” says Whitman. How do you think you’ll feel when the Parker Solar Probe finally launches? EW: I’ll feel probably sad and elated. Happy that I was part of something that’s just so awesome, but sad in the sense that I don’t want it to end because it’s just so exciting and so interesting. LH: I’m always really proud when we have a successful launch, and we’ve gotten that telemetry maybe 20 minutes after launch that means it survived and that the engineers built a really good spacecraft. But also I’ll feel really proud when we start to get the data sent back. I mean, the Parker Solar Probe is going to rewrite the textbooks with new information about the sun and the corona, and I’ve touched it—the spacecraft that’s going to fly around our sun and give scientists information that they never knew before. That’s really exciting. A mission to the Sun first recommended in 1958 is set to launch in 2018, 6 decades later. 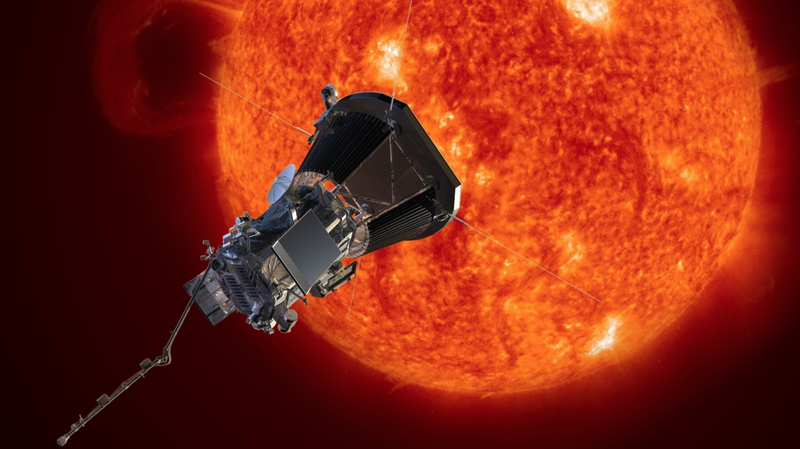 NASA’s Parker Solar Probe, which the agency plans to send to space next summer for a nearly 7-year journey, will fly within 4 million miles (6.4 million kilometers) of the Sun’s surface, more than 7 times closer than any other satellite. There, it will help scientists seek answers to fundamental questions about our star such as why its outer atmosphere, or corona, is several hundreds of times hotter than the photosphere, or the Sun’s surface. The mission “is a real voyage of discovery,” said Nicola Fox, project scientist for the probe at Johns Hopkins University’s Applied Physics Laboratory (APL) in Laurel, Md. “We’ve been to every major planet, but we’ve never managed to go up into the corona.” Until recently, we haven’t had the technology needed for a spacecraft to fly so close to the Sun and survive, Fox noted. She spoke with Eos in an interview last week in a clean room at APL where the probe was temporarily housed in its full flight configuration. APL is implementing the mission for NASA. Although scientists have learned a great deal about the Sun from remote sensing and from other spacecraft operating within the outward flow of energetic, charged particles from the Sun known as the solar wind, “you really need to get into [the solar atmosphere] to be able to answer the fundamental questions,” said Fox, who is a member of the Eos Editorial Advisory Board. In addition to probing why the corona sizzles at temperatures about 300 times higher those at the surface, the mission aims to explore “why in this region the solar wind suddenly gets so energized that it can actually break away from the pull of the Sun and move out at millions of miles an hour to bathe all of the planets,” Fox added. Entering the envelope of hot plasma surrounding the star may also help researchers understand more about high-energy solar particles. The probe is named for astrophysicist Eugene Parker, professor emeritus at the University of Chicago, who in 1958 wrote a paper about what is now referred to as the solar wind and whose work underpins a great deal of our knowledge about how stars interact with planets. In the decades since a committee of the National Academy of Sciences recommended the mission, improvements in thermal protection technology have made it possible to shield the spacecraft and its suite of instruments from the intense radiation and heat from the Sun. On 21 September, scientists lowered an 11.43-centimeter-thick carbon composite heat shield onto the probe to test its alignment and ensure that it will shade the craft and keep the instruments safe in the harsh environment. Those instruments will study the Sun’s electric and magnetic fields, plasma, and energetic particles and image the solar wind. “Everything lives in the shadow” created by the heat shield that will always be oriented to face toward the Sun, said James Kinnison of APL, a mission system engineer for the space probe who also spoke with Eos in the clean room. With the heat shield forming a cone-shaped shadow, “all the electronics stay at normal temperature [and] nothing gets really hot as long as the heat shield is pointed toward the Sun,” he said. Because the spacecraft will often need to operate autonomously when it is behind the Sun or subject to communication delays because of its distance from Earth, the probe includes a system to detect and quickly recover from even a slight misalignment of its axis. The development of solar power arrays able to withstand the intense solar environment has also enabled the mission, Kinnison said. The probe will operate on about 350 watts of power for all of its science and engineering needs, including collecting scientific measurements and downlinking data. Aside from the solar array and the heat shield, most of the spacecraft’s other components are “relatively normal,” he said. It could lead to “transformational changes to the models that we use to predict space weather,” she added. Eric Christian, deputy principal investigator for the solar probe’s Integrated Scientific Investigation of the Sun (ISIS) instrument suite, told Eos that the Sun’s activities can affect the power grid and human and satellite operations in space. Just as terrestrial weather forecasting has gotten better, space weather forecasting also needs to improve, he contended.